Tired of dough balls and garlic bread at Pizza Express and late night falafels at Maroush? With your parents coming to town it’s time to indulge in places you haven’t had a chance to visit on a student’s budget. Here’s a full, packed day to keep your family happy while they're visiting, allowing for quality catch-up time together. Make your reservations soon or just send it to your parents and let them take care of the details. STAY: Where should your parents stay? Traditionalists will want to check into The Berkeley, The Connaught,Claridges, or The Savoy. For buzzy and sceney we suggest Ian Schrager’s Edition Hotel, Andre Balzac’s Chiltern Firehouse, the Beaumont in posh Mayfair or the Thompson groups Belgraves, At Daytripper, we are big fans of the Firmdale Group, and we highly recommend the new Ham Yard.Designed by Kit Kemp in her signature comfy, quirky, unique style, it’s modern English meets bold design!! Right in Soho, bordering Mayfair you couldn’t ask for a more central location. FOR FIRST TIMERS: It may be touristy, but as London is such a vast city, a great introductory overview is to ride on top of one of the hop on hop off London double-decker sightseeing buses. BREAKFAST IN THE PARK: Head to the new Sackler Serpentine Gallery in Kensington Gardens, designed by famed architect Zaha Hadid. The sister gallery to the original Serpentine (a 5-minute walk away) it is home to The Magazine Restaurant, with German chef Oliver Lange at its helm. (Open only for breakfast and lunch) It’s worth a visit just to see the striking architectural design. STROLL: If it’s a nice day, why not take a walk in Kensington Gardens or in neighboring Hyde Park. Fun fact: most people assume Kensington Gardens is part of Hyde Park, and while it does feel like a continuation of one park, technically it hasn’t been since 1728 when Queen Caroline divided the two spaces. TAKE THEM SHOPPING: Walk over to Harrods; it’s really like no other Department Store in the world. It is always fun to spend a half hour wandering around its famous food halls. Of course, you could spend the whole day shopping here, or at the smaller but trendier Harvey Nichols, just down the block on the corner of Brompton Road and Sloane Street. 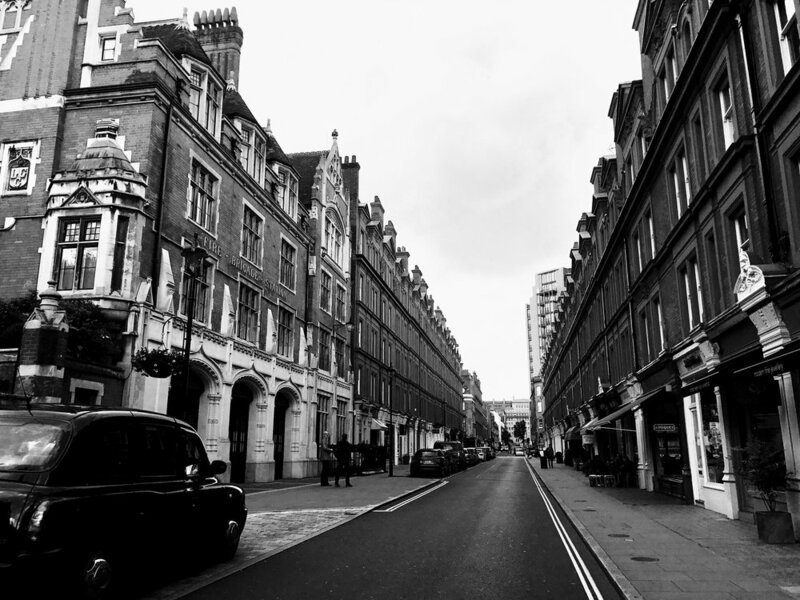 After, head out the back of Harrods and stroll down Walton Street, a picturesque street with charming boutiques. Walton Street ends at Brompton Cross, where Knightsbridge meets Chelsea and South Kensington. The Conran Shop in the historic art deco Michelin Tyre building is a great source for design inspiration. And the building itself is amazing - one of our favorites in London. If you’re feeling festive, this is a reunion, after all, grab some oysters and a glass of wine in the bar on the ground floor. If not, just a glass of wine will do. It’s such a pretty space. Across the street is Joseph, it’s always fun to check out the cutting edge selection of eclectic, high-end designer clothes along with the designer’s own label. Wander around the streets that intersect Brompton Cross for a mix of well-known designer stores like Acne, Carven and British designer Amanda Wakely. LUNCHTIME GRAZE: Jump in a black taxi and head across the embankment for lunch. We love Borough Market; this may be one of my favorite food markets anywhere in the world! Your parents will get a real feel for the best of British and International produce in a colorful market with over a 100 stalls. If you love eating and drinking there is no better place. There are so many choices—Veggie options, Thai street food, Paella, Ethiopian to name a few. Do not miss, unless you're vegetarian, the chorizo sandwich at Brindisa. Sounds so simple –grilled chorizo on ciabatta with arugula and roasted peppers. But, just wait, once you have the olive oil dripping down your sleeve in the midst of the bustling market you will dream about this sandwich, it’s that good! Cooks should go to Arabica, one of the original stalls, now a restaurant, to get their Wild Sumac and Zatar to bring home. We have never found any as good! Pop into Neal’s Yard for a stunning selection of cheeses and finish your visit with a cappuccino at Monmouth Coffee to refuel. MUST DO: Follow the embankment for a few blocks and you wind up at the Tate Modern. The Tate has been popular from day one but the Tate Modern is the icing on the cake. There is almost always something fun happening here, an hour or two on a trip to London is almost mandatory. If you need a bit of a pick-me-up, stop by the Tate Cafe overlooking the riverside. PLAY TOURIST: The Shard, an 87-story skyscraper, and Western Europe’s tallest building opened in February 2013. The View from The Shard, has two observations platforms: a triple level indoor gallery on level 69 and a partial outdoor gallery on level 72. The 360-degree views of London are pretty amazing; on a clear day, you can see up to 40 miles. Also offering killer views of the city, walk down the embankment towards the Houses of Parliament and hop on the iconic London Eye. CAN’T CUT CLASS: Send your family off on a London Walks, with at least a dozen daily guided tours it’s a very informative and highly engaging way to explore some of London’s neighborhoods. There’s something for everyone: the walks cover subjects from “The Secrets of Westminster Abbey” to the “Beatles Magical Mystery” to “Charles Dickens London”. Nighttime brings a “Jack the Ripper Walk” for those who are not easily spooked. DINNER: This is a hard choice! Kitty Fisher’s is one of the city’s hottest spots right now serving inventive food in the heart of Mayfair in a tiny, cozy space. In the mood for Indian- Michelin starred Gymkhana, or its sister restaurant Trishna both have fantastic food--this is posh Indian, not your corner curry shop. Packed, celebrity hangout Chiltern Firehouse, in an actual renovated firehouse in Marylebone, may be more about the celebrity factor than the brasserie style food, but it all makes for a fun night out. La Petite Maison is perfect for large groups with plates meant for sharing. Some say Bocca Di Lupo is the best Italian food in London. And then there’s The Ivy, recently reopened after a five-month facelift, just in time for it’s 100th birthday. HAVE MORE TIME: For another Daytripper itinerary click here to see an ideal day in the East London neighborhood of Shoreditch, comparable to Brooklyn’s Williamsburg. In other words—hip and happening.